Apparently having left the black and white dragon puppet they memorably snaked through the crowd at their last appearance in Guelph and other recent performances, Yamantaka // Sonic Titan’s roughly 40-minute Hillside set was less about the theatrics the art collective has been given attention for and more about the music. 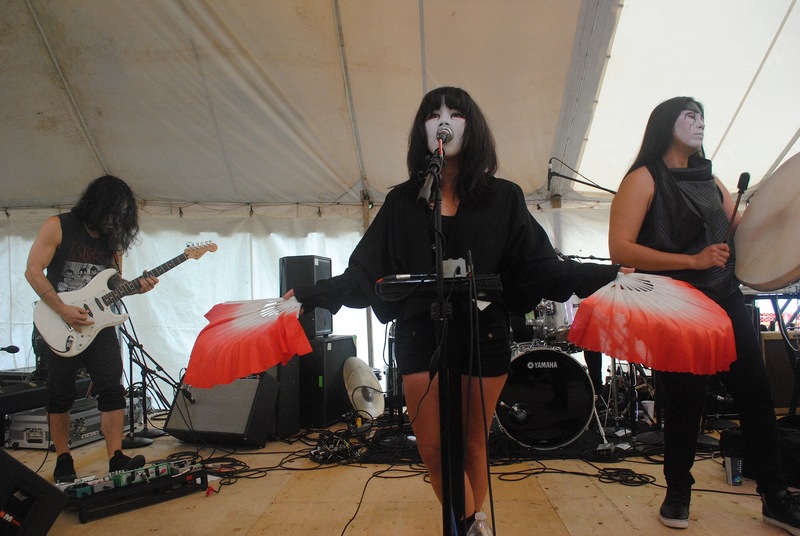 The group nodded at Noh and kabuki theatre with their characteristic face paint and lead singer Ruby Kato Attwood’s fan dancing, but that wasn’t all stuff the audience took in as the group played through its set, only breaking to introduce songs or express gratitude. Having released their self-titled debut LP in 2011, the group has otherwise only released a single, “Lamia,” via the 2012 edition of the Adult Swim Singles Program, but YT//ST still managed to go beyond providing performances of the aforementioned single and YT//ST staples like “Hoshi Neko,” “Queens,” and “Reverse Crystal Murder of a Spider” when they gave their performance at the Island Stage. Sure, all of those songs made it into the mix, but the group also served up a cover of Japanese super-group PYG’s “Hana Taiyo Ame,” and piqued interests with a new, unidentified song featuring lead vocals from YT//ST regular Ange Loft. Referring to the group’s honorific as a character, Loft sang of “Yama looking back at me” on the track, which boasted heavier, more metal-leaning instrumentals than other songs the group featured on their debut. Pair the output of that performance with the group’s announcement of a signing with Suicide Squeeze in April, and perhaps we can anticipate some new recorded material from this group in the near future. Yamantaka // Sonic Titan also performed a special collaborative workshop with AroarA on the Sun Stage at Hillside Festival. This entry was posted in Burden of Salt and tagged Ange Loft, Hana Taiyo Ame, Lamia, PYG, Ruby Kato Attwood, Suicide Squeeze, Yamantaka // Sonic Titan, Yamantaka//Sonic Titan, YT//ST on July 29, 2013 by Tom Beedham.